This has been an exciting autumn: after many years and much dreaming, I finally made it to Friesland for the first time! When you're traveling in the Netherlands, a bit of Dutch is very helpful, even in the province of Friesland itself. Some areas, such as the capital city of Ljouwert (Leeuwarden) are predominantly Dutch-speaking. Many signs tend to be in Dutch. Even the commercials on the Frisian TV station are in Dutch. That said, lots of people speak English and German too, so I didn't feel like I had to learn huge amounts of Dutch to get by. Tige tank meaning "many thanks." The first syllable of tige sounds like the English word "tea" and the second takes a schwa. Tank has the usual long -a- like in "father." TEE-guh TAHnk. The great thing about this phrase is that it is very obviously Frisian: no possibility that you are just going about mangling Dutch or German. Oant sjen - This means "see you again" or "good-bye." It sounds a lot like "want chin"...not the most graceful way to remember it, but it's best to go with whatever works, right? Again, this is a specifically Frisian expression (in Dutch they say tot ziens). You can show your interest in the language by using it. Hoi! This is an informal greeting meaning "hi!" that you hear. It sounds just like the English "ahoy!" if you drop the first syllable. I think it's both Dutch and Frisian. People sometimes exchange it as a greeting when you are passing by each other on the bike trails. You also hear agoeie sometimes. That seems more specifically Frisian and is a general greeting. A with schwa sound, and goeie sounding like the English word "gooey." People wish each other "luck" or "success" far more frequently than in American culture. This can be a good expression to use if you are saying good-bye or parting. You can say either Lok! or Sukses! Note that lok is pronounced with a long "oh" vowel so it rhymes with "woke." Leaver dea as slaef - "better dead than a slave," famous from the Battle of Warns. There is more on this blog too. Fryslân boppe! - "Friesland rules!" 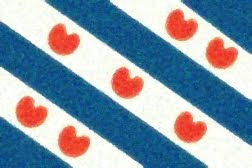 or "Friesland over all!" (boppe literally means "on top" or "above"). If you're not feeling like being nice, there's also Fryslân boppe en de rest yn'e groppe. "Friesland rules and all the rest drool," we might say in English... but it literally means that everyone else is in a ditch or gutter. Foar de kofje net eamelje - "Don't hassle me before coffee."